A passion for the North West Slopes and Plains and its agricultural potential born a century ago is about to inspire a new generation through the D.L. McMaster Fund. Douglas McMaster, a well known grazier and prominent Graziers' Association of NSW figure, was in his twilight years when he bequeathed 2500 acres (1011 hectares) of his Warialda property Inverness to create a UNE research station in 1964. He saw it as a means of developing the soils he loved so much, giving School of Rural Science researchers the opportunity to practically test and apply new techniques. 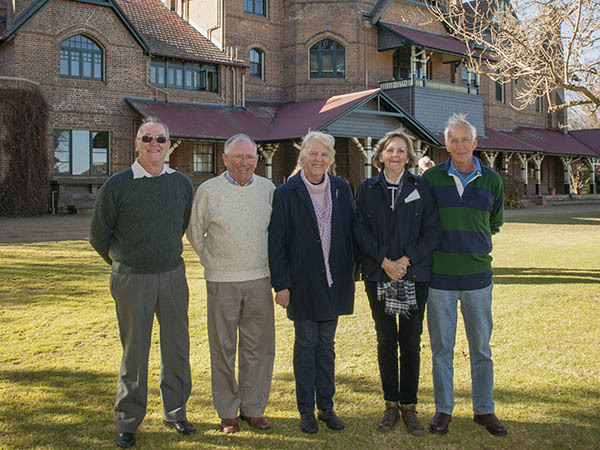 Now, following the sale of the property and establishment of the D. L. McMaster Endowment, students from the Warialda shire will have the opportunity to carry on his legacy. The endowment will be used to fund daytrips for Warialda High School students and/or farm groups to visit UNE's Armidale campus and to tour our SMART Farm. It will also provide at least two undergraduate housing scholarships for students from Warialda to study agriculture, and fund research projects into profitable and sustainable whole-farm systems relevant to the North-West Slopes and Plains of NSW. "Uncle Doug was a trailblazer and a very passionate, forthright man," said Mike Donaldson, his great nephew, who worked for him for a time as a jackeroo. "He was an early adopter of rotational grazing. He used to keep his sheep in small paddocks and constantly move them around, saying that even a change of scenery was good for them. He was always keen to educate other farmers about how to improve the running of their farms, especially the management of pastures. I think he hoped the land he bequeathed to UNE would have a lasting impact. Douglas' own contribution to the local community and grazing industries was considerable. He was vice-president and later president of the Graziers' Association of NSW, and served as a councillor with the Yallaroi Shire Council and committeeman of the Warialda Show Society. A newspaper obituary described Douglas as a "practical and successful grazier", who backed the promotion of wool and levies to publicise the advantages of wool over synthetic fibres, and a man "of firm opinions, which he was not afraid to express". While recognising the importance of wool and meat promotion, he also saw a need for research into the problems peculiar to the slopes and plains country of the North West of NSW. At the McMaster Research Station, in the heart of one of the most fertile areas of the state, no-till, stubble management and rotational farming systems were later trialled. "He would be happy that other Warialda students, keen to learn and carry out research, might one day help to improve our understanding and management of the region," Mike said. "In many respects he was ahead of his time and his donation of the land was certainly a very unusual and generous gesture for the day." Find out more about The D. L. McMaster Fund Endowed Housing Scholarship.